National public sentiment is running very high against the oil industry in general, and BP in particular. But the closer you get to the coast the more moderate the feeling becomes. I’ve talked to oilfield workers who were shocked that this happened on a BP rig, because in their experience BP is more stringent about safety measures than any other firm. 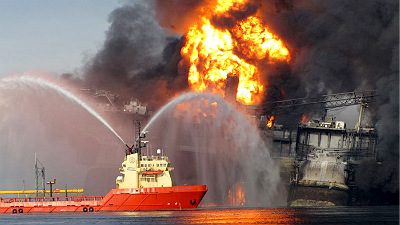 ….It’s not cheerleading — everyone is very clear that they want BP to take full responsibility. And feelings will change if the crisis worsens, if the joint command doesn’t quickly get the leak and the spill under control, or if BP tries to shirk its responsibility now or in the years to come. To my ears, it sounds oxymoronic to describe BP as “a very responsible spiller” (Mary Landry, a rear admiral in the Coast Guard), but it’s been an interesting perspective to see how differently offshore drilling and BP are perceived down here. Of course, this isn’t an unusual reaction. Loggers have a different attitude toward old growth forests and miners toward mountain top removal than outsiders do. When it’s your job on the line, you have a lot more sympathy toward dangerous/polluting industries than your average urban white collar worker. Still, it’s an interesting note about BP. Just thought I’d pass it along as food for thought. The other side of the story is ably told by James Ridgeway here and Kate Sheppard here.